For Ashura, the ayatollahs put on a show to impress the world with their male-chauvinism ideology of political Islam.Its message,seek freedom, is lost. Some 1340 years ago, the third Shiite Imam, Hussein, with a handful of his followers, battled against the Caliphate, and lost. In the sixteenth century the Shi’ism was declared the official religion of Iran, and the martyrdom of Hussein became the important date in Iran, Ashura, a ritual of show of male-chauvinism. The Iranian theocratic regime is going through rough times. It is an ageing system animated by the illusion of the “Glorious Islamic Revolution”. The contrived election of Hassan Rouhani to the presidency is boomeranging, sooner that it was thought possible. The illusion of the JCPOA, the Iranian Nuclear Deal is fading fast among quarrelling parties. The Iranian nefarious politics in the Middle East is also boomeranging. The Russian intervention in Syria, in which their Iranian ally has been backing Al-Assad family since 1979, is now even known to teen-agers in the West to the dismay of the conceited ayatollahs and their cronies, who are too eager to be favourably positioned under the international media spotlights, as the world’s champion of fairness and justice. The inflation rate is less than a year before since there is no money to spend. The pollution kills more people than any cancer known to man. The young generation is depressed and has very little ambition. The corruption has taken proportions unheard of, even by the low Iranian standards in such matters. In the eyes of the international observers, the Islamic Republic of Iran is notorious for its harsh punishments and its bigotry. Up to this point in 2015, the number of death sentences carried out nears a thousand; many are persecuted and jailed for their enthusiasm in supporting football, being on Facebook or sending Telegram Messenger. In Iran today, imbecility is so common that no one is troubled. Every year for Ashura, Iranian clerics have to put on a show, and impress the world with their power. But the Iranians are weary of such displays. The Islamic rhetoric sickens them. At last, they have realised that the nuclear facilities are by far a more complex issue than the oversimplified notion of uranium enrichment being a heaven-sent remedy to the political and social ills. What matters to them is the safety of their family, a badly needed job and a decent life. None of which can be expected in the short term, not with the ayatollahs at commands. Moreover, the ayatollahs’ unyielding and dogmatic views repulse the public outside Iran, and their belief in their own importance is seen as megalomanic. They scarified Iranians to gain prestige among “Omat-e Eslam”, i.e. all Muslims. Today, despite ayatollah claims of justice for all, and peace upon everyone, be it Muslim or non-Muslim, the situation in the Middle East has gone from bad to worse. A full-scale war with its trail of savagery and tragedies is on. This war is patricide, parricide, matricide and fratricide. It calls on the basic bestialities in humans, not on civilised manners. The ayatollahs blame the USA and Israel for it; they too cover up their own evil deeds and fuel the conflicts by their proxies. As expected from a manipulative and dictatorial regime, the Iranian media, mouthpiece of the ayatollahs, give the day’s events full coverage, this year in Arabic, backed-up web sites and gathering of alleged “Arab communities”. After the Mecca Stampede, Iran had to flex its muscles to Saudis. Every ayatollah, minister, and head of some office was photographed wearing black and tears over his face. The articles written by the press are a testimony to the cultural level of today’s average Iranian: appalling grammar and misused vocabulary, and recurring clichés. Nothing analytical, just a torrent of cheap propaganda that Iranians take for “Some News” and it does not bother them in the least any more. For a nation that boasts the highest level of educated people in the Middle East, having news outlets of such poor quality is a humiliation and once more evidence of hollow declaration of male-chauvinists. The collective and individual behaviours are numbed by oversimplification in all matters. Simplification throttles the curiosity and the readiness to grasp the issues in their complexity. Since 36 years ago, a gang of certified despots is ruling our country. Whatever the spiritual and symbolic teachings of Ashura, it has been wasted on us. We have no courage to stand up to the ayatollahs’ despotism. We falter, we accuse and denounce each other, and have no pity for those who claim their rights as human. Compassion is believed to be the act of the feeble and the weedy, dishonesty that of the strong and the smart. Those who stand up for truth are ridiculed, liars are prized. 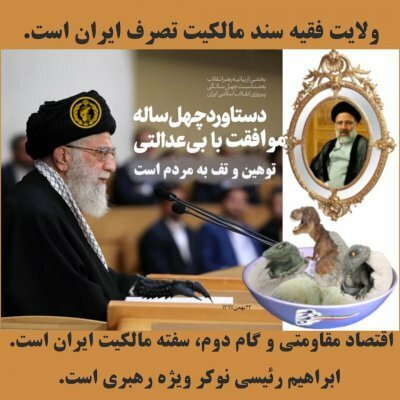 These are favourable ingredients to the ayatollahs. The more the population is confused in its ethics, the more the ruler is strengthened. As it is the custom, the Shiite hierarchy spared no effort in pounding the drums of Ashura, displaying once more the male-chauvinism. From the Leader to the lowest ranking, all were mobilised for the day, preaching everywhere. Hundreds of pictures taken on Ashura belonged to a male chauvinist Islamic society in which women are merely tolerated, and used as an alibi when necessary. A society that has institutionalised systematic brainwashing from the cradle. The news we get about Iran in the Western media is from the tiny patch of the North of Tehran. Our views on Iran are shaped by Tehran’s glitter, if consumerism can be called so. Forget about the beautiful women of the North of Tehran, made up and sculpted by surgery. Forget about the wishy-washy discourses of your dandy friends driving you from one lavish party to the next. They are pleasant to see and to hear, but they have no power in pushing for social and political reforms. 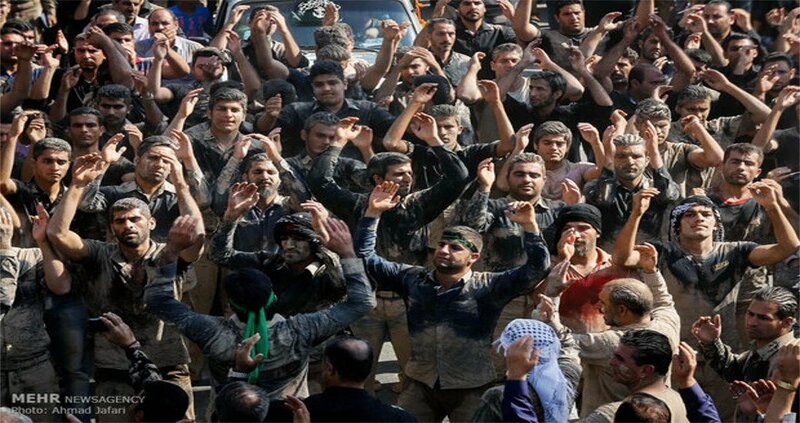 Today Ashura is a duff spectacle, a cacophony, just a symbol of the male-chauvinism. We have forgotten the message of Ashura: to seek freedom, to stand up against tyranny and to protect the rights of all, the welfare of all.